Bobby Hull is best known for his curving of the blades of his hockey sticks, allowing for unpredictable trajectories of shots. The NHL actually had to make a rule change to protect netminders from injury. Since 1970, the maximum curvature that was allowed for a blade was one-half-inch. When his professional career began in 1957-58, his stats were not too impressive. It wasn’t until his third full season that his full potential was seen. He led the league in goals (39) and points (81). Two years later he would also lead the NHL in both categories with 50 goals and 84 points. In 1965-66 he became the first player in league history to surpass the 50 goal plateau. He scored 54 goals and 97 points, both of which were personal bests at that point of his career. Hull would lead the NHL in goals four consecutive years starting that season. The last of those seasons he scored 107 points, the only time he reached the century mark. He was such a good pure goal scorer that he actually recorded 50 more goals than assists over his NHL career. After leading the league in goals and points the year before (39, 81), his point total would drop to just 56 the following year (1960-61). He made up for his lack of regular season offense by scoring 14 playoff points in 12 games, helping Chicago win their first and only cup in Hull’s tenure with the team. Chicago would go far in the playoffs numerous times, often making the Stanley Cup Finals. Hull helped the cause by leading all playoff scorers in goals three times. He even scored 8 goals (10 points) in 1962-63 when Chicago only played 5 games! He would score a total of 129 points over 119 post-season games. In his NHL career, he won the Art Ross three times, the Hart Trophy twice, the Lady Byng Trophy once, and was named to the All-Star Team a total of 12 times. Only two of those 12 years were on the Second Team. Hull would go on to play the rest of his career in the rival World Hockey Association. He believed he wasn’t earn enough money in the NHL. His WHA contract was the famous $1 million, 10 year deal. League owners from around the league had to chip in to afford him. At age 34 he scored 51 goals and 52 assists in 63 games for the Winnipeg Jets. Two years later he would score 77 goals and 142 points. After hitting the century mark two more times in the next three five seasons, Hull would land in Hartford after missing most of the 1978-79 campaign. In 1979-80 he would play just 9 games with the Whalers. At 42, he actually attempted a comeback with the Rangers back in the NHL, but it was unsuccessful. But he had already contributed enough to the game of hockey. If you combine his professional totals, you get 913 goals and 1,808 assists. 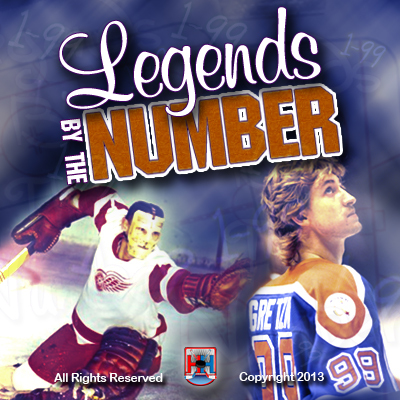 If his WHA numbers were NHL numbers, he would have been the NHL’s only 900 goal scorer in history (Gretzky finished with just 894). His point totals would have ranked him 4th all-time. Now I’m not saying he would have continued to score at such a high pace had he stayed in the NHL, but he did leave the league when he was still dominating the game. The hockey world will never know how he would have done. You could almost guarantee he would have hit 800 goals though. At just 5-10, 170 pounds, Maurice “The Rocket” Richard was feared. In his first season in the NHL, he scored 54 points in 46 games. In the playoffs that year he scored a league-leading 12 goals (17 points) in 9 games. He would win his first Stanley Cup in his first full season. In just his second season, he scored his famous 50 goals in 50 games. No player had ever scored 50 goals in a season before. The next Hab to accomplish that feat was Bernie Geoffrion, in the year immediately following Richard’s retirement. He would lead the league in goals a total of five times, which is why such a trophy as the “Rocket Richard Trophy” exists now. Richard scored 544 total goals in his career. He also amassed 965 points in 978 regular season games played. His 45 goal campaign in 1946-47 earned him a Hart Trophy as league MVP. In addition to winning a Cup in his first full season in the NHL, Richard would win hockey’s most treasured trophy seven more times! He would finish his career by winning his last of five consecutive Cups in 1960 (Montreal won every year from 1956-60). He led all playoff participants in goals five times. At 36, he scored 11 goals and 15 points in 10 games, his highest goal and point total since his first full season (when he was 22). For the final four of those winning seasons, Richard was team captain. He had a bit of a temper throughout his career, as is reflected in his 1285 penalty minutes. Richard was passionate about the game of hockey, and it was shown every night. Only four players in history have won more Stanley Cups than Richard’s eight. The Rocket always wanted to be able to perform at the highest level possible, which is why he decided to retire from the game. Injuries had taken a toll on him late in his career, and he knew he could no longer perform as well as he was known to perform. After retiring as the league’s all-time leading scorer in 1960, his number would be promptly retired by the Habs. He was inducted into the Hall in 1961, after the waiting period of three years was waived. He was the first French Canadian Hall-of-Famer. Accolades – His Hall of Fame induction, four Stanley Cups, six Hart Trophies, six Art Ross Trophies, Lester Patrick Award, 21 time All-Star selections, and six decades of playing. If you haven’t heard of Mr. Hockey (insert registered trademark here), then you have no business watching the game of hockey. By the time his long and storied career was over, Gordie Howe had forever changed the game. Be it from his leadership, his skill, his determination, his success, Howe is a legend. He is the only player that, to this day, still gives Wayne Gretzky a run for his money in the “greatest player of all-time” argument. For those that argue in favor of Gordie, you are from wrong. In many ways Howe is far and away the best all-around player the game has ever seen. He played professionally from age 18 to age 51. Chris Chelios has nothing on Howe’s longevity. While Chelios played in 26 NHL seasons (same as Howe), Gordie played in a total of 32 professional seasons (with the NHL and WHA). No one will ever break that record. Howe played in a record 1,767 regular season games and a record 1,687 NHL regular season games with one team (Detroit). For much of his career, he played on the famous Production Line with Ted Lindsay and either Sid Abel or Alex Delvecchio. From 1950-78, Howe scored more than 20 goals in each season. From 1951-53, 1957, and 1963, he led the NHL in goals scored. He also led the league in points six times. He was never afraid to get physical and use his elbows. He was a feared opponent on the ice. There is even a hat trick named in his honor. The Gordie Howe hat trick is unofficially awarded to any player who records a goal, an assist, and a fight in a single game. From 1950-55, Howe helped the Wings win four Stanley Cups. He led the league in playoff goals three times and in playoff points six times. He finished his career with 160 post-season points in 157 games. At age 41 he retired from the NHL. At age 45 however, he jumped at the opportunity to join the Houston Aeros of the WHA. There he would have the chance to play with his sons Mark and Marty. Howe would play for the Aeros the 1977-78 season, when he joined the New England Whalers. With New England, he was able to continue playing with his sons. In his first year as a Whaler, Gordie led the team in scoring at age 49 with 96 points. Mark finished second with 91. He would remain with the team when they joined the NHL and were renamed the Hartford Whalers. He would officially retire from professional hockey at the age of 51. In 1997 he signed a one-game contract with the Detroit Vipers of the International Hockey League. Playing one shift in the game allowed Howe to play in his sixth decade. That record might be the most set-in-stone achievement the game has ever, and will ever see. When you combine his professional stats from the NHL and WHA, Howe even has more goals (974) than Gretzky (940). His #9 sweater was retired by Detroit, New England/Hartford/Carolina, and the Houston Aeros. Howe was elected to the Hall of Fame in 1972 after his first retirement from the NHL.